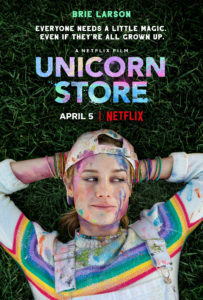 Unicorn Store revolves around Kit (Larson), an art school drop out who just moved back in with her parents. She is not sure what she wants to do with her life and ends up taking a mundane office copying job. A short time later, Kit receives an invitation to come to The Store. 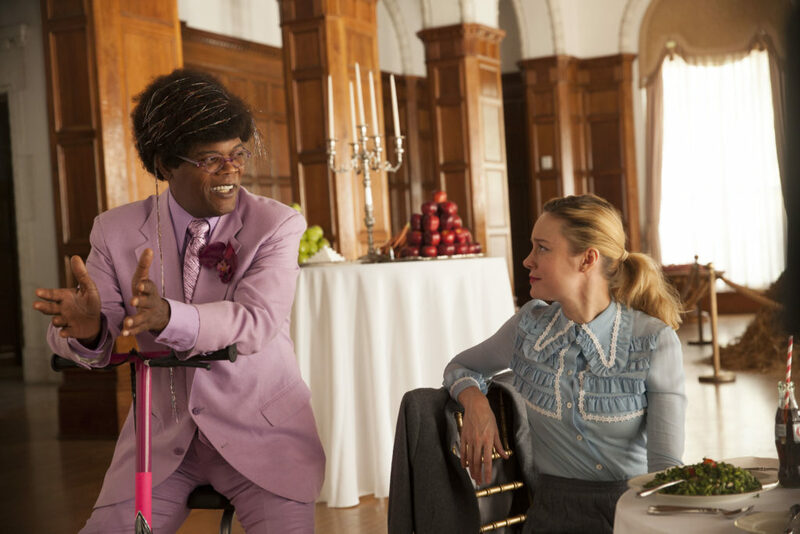 It is there that she meets The Salesman (Samuel L. Jackson), who tells her that she is next in line to receive a pet unicorn — but only after she completes a series of tasks to earn it. Yes, that description sounds seriously outlandish and childish. Even writing and re-reading it comes off as absolutely ridiculous. But Unicorn Store sets its tone early and then spends a good portion of its 92-minute running time waxing nostalgic about Kit’s past, present and future as a dreamer and an artist who does not live or play by the rules of the real world, even when everyone around her is telling her otherwise. Much like Kit herself, the film maintains a strict wide-eyed childlike innocence that never really dissipates. That innocence does not do the film any favours, especially when the story brings in a decidedly not so innocent subplot involving sexual harassment in the workplace. It’s an odd pivot for the film, made worse because it seems forced and oddly comical (though I will admit this element feels oddly more pronounced given the current climate we live in, versus when it premiered in 2017). And if that addition was not strange enough, Unicorn Store never really lets on about the deeper seated issues affecting Kit and gives even less details about the supporting cast that surrounds her. They all have their quirks and quick funny moments, but everything we learn is one-dimensional and superficial, with many of their actions leaving the audience just as emotionally stunted and confused as Kit is. More depth would have gone a long way for these characters to not just feel like wholesale cut-outs from other indie films. It is a real shame that the supporting characters are not given enough to work with, because Larson has really put together an enjoyable cast of players here. 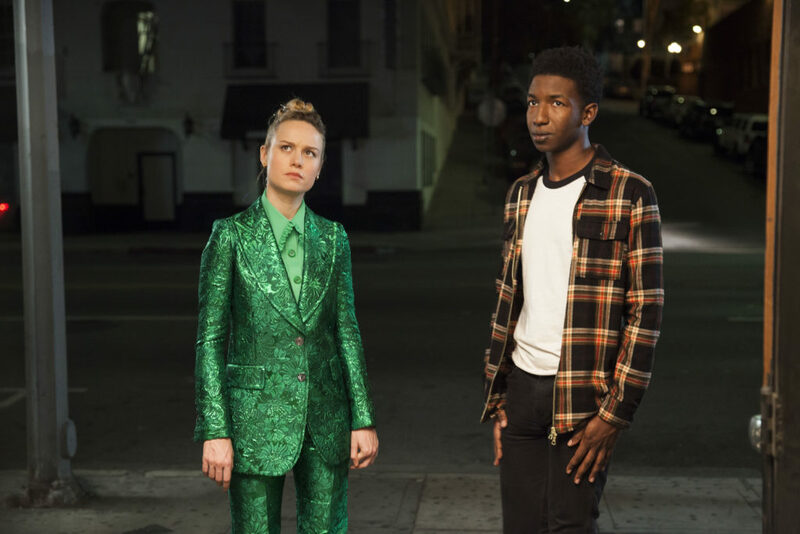 Mamoudou Athie, Bradley Whitford, Joan Cusack, Martha MacIsaac, Ryan Hansen, Karan Soni and Hamish Linklater all show they have what it takes to really make something of their characters (and most land at least one or two funny lines), but the film does not give them all the tools they need in order to achieve it. Jackson stands out above all of them with his wild, enigmatic and chaotic performance, playing his character with the same loud ferocity he is known for — but with a quiet charm that is missing from his more fearsome portrayals. It’s the polar opposite of the kind of work he tends to gravitate towards, and is much more in line with his uncharacteristic performance in Captain Marvel than anything else he has done as of late. But the film’s standout performance comes from Larson herself, who takes control from the very start and demonstrates her terrific emotional range throughout every single one of the frames she’s featured in. She gets the best moments in the film, and does a very worthwhile job convincing you to care about the plight of her character. And while Kit is not as clearly defined as she should be, Larson does a very good job using her facial expressions to get across as much of the missing information about her character as she can. In the end though, as I continue to write, re-write and edit this review, I am left with the same question I had after watching the film both times: why was this the movie Larson chose to make her directorial debut with? Unicorn Store is a very atypical indie film, shot like an indie film with happy-go-lucky instrumental music and a flair for creative lighting effects and arts and crafts. It has some fun moments sprinkled throughout, but there’s nothing here that sets it apart from other films (or more specifically, other festival and Netflix films) and no specifically unique element that can Larson claim for her own. So what is it that drew her into this half cooked story and what made her want to tell it herself instead of just starring in it? The answer lies somewhere within this Unicorn Store, but after taking two trips, I think I’m okay not figuring it out.